Fresh Economic Thinking: Why is return-seeking optimal? In my rather long introductory post on the new theory of the firm I developed with Brendan Markey-Towler, I listed many important characteristics of our model. I now want to invest some time expanding on these points in a series of posts. The first characteristic of our model is the way we relaxed assumptions about market conditions. Rather than the unrealistic free entry and exit and perfect knowledge conditions that define most models, our model world is simply defined by a scarcity of resources. In the paper we make a peripheral link between return-seeking firms and maximising the value of a firm’s real option to invest. We do this because real options analysis also relaxes many assumptions about market conditions compared to the mainstream model, which leads to a rather different firm objective. But I believe there is a closer link. Dixit and Pindyck showed that under the realistic situation where firms face uncertainty about the future, and where costs incurred in production are irreversible and able to be delayed, that the value-maximising strategy of the firm is to jointly maximise 1) their current profit, and 2) the rate of change in firm value. As time reaches its infinitesimal limit the flow off current profits is zero and firms simply maximise the rate of change of firm value over time. In our model the foundation assumption is the maximisation of profits divided by costs, which we show maximises the rate of change of profit per dollar of cost. Is there a consistency here between a change in firm value per period of time, and per dollar of cost? Time is money isn’t it? The logic behind this connection rests on the principle that there is a finite amount of resources available per period of time to utilise in order to increase firm value. Resources are scarce after all. Thus the practical expression of firm value maximisation that emerges from conditions of real resource constraints is return-seeking, or attempting to maximise the rate of return on all costs. Where our model differs to analysis under real options is that we make no claims about the path of firm values over time. In our model the path of firm value is a result of active choices by firm managers rather than some assumed process. We now show more concretely how the process of continuous capital investment choices in our model of return-seeking firms results in investment and output choices that conflict with traditional models. Consider the optimal planned output level for a new investment in a production unit of some sort (call it capital if you will). For a firm requiring a particular threshold rate of return on their new investment (commensurate with its perceived risk and the alternative investment options for these resources), the output level for that production unit that will first justify its investment will be the output level that maximises the rate of return on all costs. Let me just repeat that. When a firm is assessing a new investment of any kind, they will commit to it when the maximum rate of return exceeds their hurdle rate. 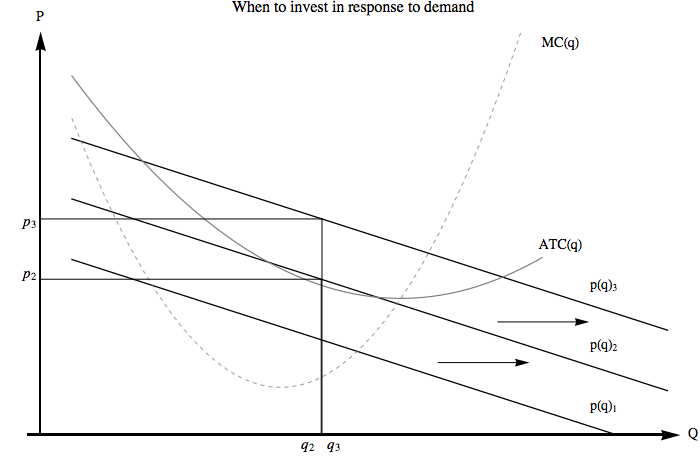 Look at the diagram above showing the traditional firm cost and demand curves for some discrete investment choice. At time t=1 the demand curve, p(q)1, is below the average total cost curve at all points. Thus there is no positive return to be gained from this potential investment. At time t=2 however, demand has shifted so that there is now a point (at q2) where investing in this new capital will provide a positive rate of return. The timing of this new investment will be when the maximum rate of return exceeds the hurdle rate reflecting the perceived risk in that market. Finally, at t=3 this firm will produce a slightly higher output at the greatly increased price if they remain on this cost curve. If other cost curves are available then a firm will expand output by ‘jumping’ to the next available cost curve at the point that maximises the rate of return on costs (also remember that the capital, or production unit, space exists only as discrete set of curves). Capital investments are made on the basis of planned production at the point on their cost curve that maximises their rate of return. Traditional economic analysis has no agreed method for dealing with the process of capital investment - either capital is fixed, or it has already perfectly adjusted to the ‘long run’. The active choice of capital and the output for which it is designed to be utilised, is not a consideration. In our more realistic model world capital choices are being continually made. Therefore in normal operation of markets, where expectations are reasonably good on average, capital will be utilised at the point that maximises the rate of return on all costs. Our setup of capital input choices as cost curves existing in a discrete space also allow firms to continually invest in new operations. In order to analyse firm price, output and investment choices in the model we have no need to invoke arbitrary time periods where some arbitrary inputs into production are fixed or flexible. Our firm decision rule is therefore one that firms can use to make investment choices to most rapidly grow their firm value in a world of scarce resources. "Dixit and Pindyck showed [...] that the value-maximising strategy of the firm is to jointly maximise 1) their current profit, and 2) the rate of change in firm value. As time reaches its infinitesimal limit the flow off current profits is zero and firms simply maximise the rate of change of firm value over time." Could you perhaps provide more precise reference (which part of Dixit-Pindyck book)? Because I don't think that's how continuous-time optimization works - if firm's objective is to maximize its value, Hamilton-Jacobi-Bellman equation will include both terms with value function and instantaneous profit flow. "When a firm is assessing a new investment of any kind, they will commit to it when the maximum rate of return exceeds their hurdle rate." Indeed. That however doesn't imply that, conditional on project being started, they choose return-maximizing scale. You seem to have in mind a situation where the firm has a list of projects, ranks them by IRR and approves each whose rate of return passes the hurdle rate (so in some sense, it maximizes return). The point (which I tried to get across previously) is that in your model, different choices of "q" correspond to mutually exclusive projects (if I choose scale q1, I cannot choose scale q2), with incomparable cash-flows. In such case, every corporate finance textbook tells you that looking just at IRR is problematic, and NPV is more suitable criterion. "Traditional economic analysis has no agreed method for dealing with the process of capital investment - either capital is fixed, or it has already perfectly adjusted to the ‘long run’." Depends on the meaning of "agreed", but no - of course people have studied dynamic of investment at length. Look up e.g. Abel & Eberly (1994) AER paper for a general model of firm's investment choice, or Caballero chapter in Handbook of Macroeconomics for more general survey. And, BTW, I'm not trolling. OK, maybe a little. But I think these are legitimate comments that you could get from any mainstream economist. "And, BTW, I'm not trolling. OK, maybe a little. " You do have a reputation. "But I think these are legitimate comments that you could get from any mainstream economist." You'd be surprised at the often conflicting comments from the mainstream. We've had everything from "We know this already its standard theory", to "It's complete rubbish". So it's getting hard to really take anyone seriously. To address your general point. p104 of D&P (We are in discussions with Pindyck at the moment about the connection between return-seeking and value maximisation. We hope it turns out to be fruitful). "The point (which I tried to get across previously) is that in your model, different choices of "q" correspond to mutually exclusive projects (if I choose scale q1, I cannot choose scale q2), with incomparable cash-flows." The story I have in mind is this. Imagine that every dollar you spend as a firm comes from a different investor. You keep expanding output, increasing costs by adding investors (who share profits in proportion to their contribution). You do this only if the overall rate of return on the total costs is increasing. Once you hit that maximum rate of return, adding additional investors to cover greater costs reduces both profits and returns, and hence the value of a share, for existing investors. For a numerical example, if 10 investors pay $1 each to earn a 20% return, or $2 profits in a period, they should not expand output by adding an 11th investor to cover the extra dollar in costs if it generates less that $2.20 in profits, or a 20% return on costs. Say this 11th investor increases profit by $0.10, overall firm profits per period are up, but profit per investor is now $0.19 instead of $0.20. I will look at the papers you cite.